3-Wheel Drive - Bio for the best party band. 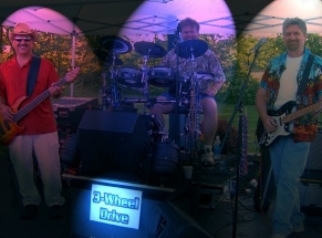 3-Wheel Drive was formed in 2003, and has been a working party band since. The group is dedicated and determined to perform frequently. With hundreds of gigs behind them, the band is very experienced and leaves a long trail of fun parties including: festivals, conventions, holiday celebrations, weddings, birthdays, anniversaries, pool parties, hog roasts, street parties, frat parties, and the list goes on. Just read the testimonials for some details. Through most of 2009 our percussion section has been in turmoil. It gives us great joy to announce that the turmoil is behind us as we welcome the newest member of 3-Wheel Drive, David Villwock, drummer extraordinaire and all-around nice guy. 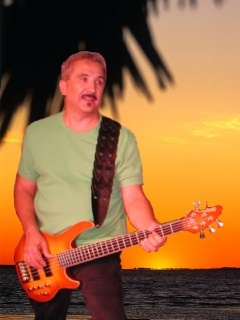 Ely Bass: Ely started playing bass professionally while in college. In the 70’s, he gave up music to pursue other career interests. In 1995 he got involved in an original, alternative rock music project, Millhouse. Since then, he has played bass for a few more original and cover rock bands, namely: Woody, Assorted Nuts and The Yardangs. Mike Nestor, Guitar & Vocals: Mike started playing when he was 12. He was soon caught up in the excitement generated by the Beatles, Rolling Stones, Yardbirds, and other 'British Invasion' groups. He played in several bands during high school and college, and then took a brief 'hiatus' to raise his family. During his ‘sabbatical,’ he performed sporadically as a solo acoustic guitarist, and occasionally sat in with various friends from the Columbus music scene. Mike again started performing professionally in 2000, when he and a friend formed the popular local rock group, Inside Straight. Inside Straight performed at many nightclubs and social functions throughout Columbus and Central Ohio. Mike also performed with a regional 60's revival band. He left the 60’s band to help form 3-Wheel Drive. Mike’s latest project hit the ground running in late 2003 and hasn't shown any signs of slowing down. Mick Wolford, Drums & Vocals: Mick began playing drums when he was 11. He was active in his high school marching band, jazz band, concert band and state concert band. His high school percussion section won numerous awards including best percussion at state and tri-state contests and over 30 superior awards at solo and ensemble contests. His first rock band performed at a talent show when he was a junior in High School. The type of music he played spanned many genres including 50's, Elvis, polka, concert band, country, gospel, variety, rock and hard rock. He was even an orchestra drummer for theater productions. Your party doesn't need a bigger band. 3-Wheel Drive makes expert use of MIDI tracks to add strings, horns and keyboards. This trio can sound like a large band for a small price. IM us now.